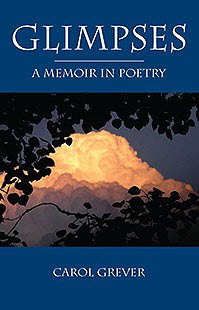 Carol Grever’s full-length poetry collection, Glimpses: A Memoir in Poetry, is now available (Outskirts Press). Widely known for her nonfiction books on straight spouse recovery (My Husband is Gay, When Your Spouse Comes Out), Carol’s new book mines four decades of poetic expression in the light of present understanding. Distinct personal stages emerge through seven sections of intimate insights. Particular interests and longings appear and change. Mistakes chasten. Crises strike, love heals, forgiveness brings recovery, and meditation, serenity. Together, the poems offer brief glimpses of a life edging toward an end with acceptance and peace. Every reader can identify with the human quality of these carefully crafted poems. To learn more or to order, visit Amazon, or visit Carol’s website.